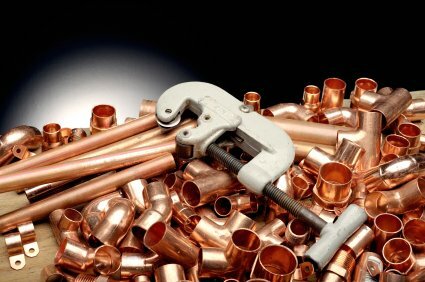 Looking for a Plumber to work on your Blue Springs Pipes? We’ve been fixing Blue Springs Missouri’s piping systems since 1985. It’s a potentially dangerous job that requires the skilled hands of a professional ... which is why you should call Kevin Ginnings Plumbing Service Inc.! There are many piping problems that require emergency service. For urgent piping repairs in Blue Springs MO, we’ll meet you anywhere in town at any time of day. If you’ve noticed that your sink or bathtub doesn’t have the same water pressure it usually does, you probably have a leak in your pipes. If you notice this, do not wait any longer to call a Blue Springs piping specialist. The longer you wait, the worse the problem will get. Call Kevin Ginnings Plumbing Service Inc. 24/7, and we’ll help you avoid costly repairs and damage to your home caused by leaky pipes. Call (816) 832-4322 immediately if you start to notice brown water coming out of your kitchen sink. Don’t drink it! It could contain rust, dirt and minerals. The Blue Springs piping experts at Kevin Ginnings Plumbing Service Inc. will be able to use their years of expertise to diagnose the problem, and we’ll be done and out the door as soon as possible. We can also make any piping system in Blue Springs more efficient and eco-friendly. One way we do this is by insulating your pipes. With insulated pipes, the hot water traveling through them will stay hotter longer, using less energy and saving you money. If you don’t like your energy bills, just call Kevin Ginnings Plumbing Service Inc. and ask what we can do! With our round-the-clock availability and commitment to improving our customers’ piping systems with our fast and friendly service, we can help you solve any piping problem. When you think piping in Blue Springs Missouri, think Kevin Ginnings Plumbing Service Inc.!